What Happened to the Truth? A few days ago the president-elect of the United States, Donald Trump tweeted that he won its popular vote for the presidential election, this despite the fact that he lost it with at least 2 million votes. The argument he presented to support his claim was that 3 million illegal immigrants purportedly had voted against him. This was a lie aligned with propaganda designed to promote the creation of an Orwellian state: “War is Peace. Slavery is Freedom. Trump won the Popular Vote.” There is no proof whatsoever of any systematic election fraud and common sense tells us that the last thing an illegal immigrant would want to do is to take the risk of making his or her existence public at an election booth. Not surprisingly, the origin of this Orwellian lie is to be found in the most well-known American conspiracy theorist, Alex Jones. While both Trump and Jones have been campaigning against a New World Order, this seems exactly what they are intent on creating and a basic fundament of this would be that people become unable to distinguish between truth and falseness. Someone might rightly ask: Are conspiracy theorists not supposed to reveal conspiracies rather than concoct them? Not anymore, since the shift into a dark age of the Sixth Wave, conspiracy theorists are often the chief sources of the disinformation they claim to work against. The Internet abounds with such web sites. Jones’ disinformation about the popular vote just happens to be a very clear example. After the shift into a night of the Sixth Wave a large number of people have come to distrust the MSM (mainstream media) to such a high degree that they become prone to fall victim to absurd claims such as the abovementioned. At the same time so-called fake news is becoming widely spread and people no longer know what to believe in. Among some politicians and conspiracy theorists lying no longer seems to be considered as unethical and they will say anything if they think it serves their agenda. Naturally, if people can no longer distinguish between truth and lie, a strong foundation for the creation of an Orwellian state has been laid, especially if you can distract people to believe that this threat comes from other countries and globalism rather than from their very own country and the misuse of its political system. While lying among politicians is not new what is new is that it is no longer widely considered as unethical and so we have reasons to ask what may be the origin of this change in mentality. Granted, the character of particular individuals may be playing a role for the rise in disinformation, but it also seems this phenomenon has a broader origin as people at large now find it more difficult to discern for themselves what is truth and what is not. To add to this difficulty, those that are lying are usually projecting their own lies onto their adversaries, claiming that the latter are the ones who are lying. Projection has thus become a major manipulative mechanism of conspiracy theorists. We have come to a point where fake news, lying and projection upon those that tell the truth, have become so prevalent that we have very strong reasons to suspect that these are characteristics of the dark age that humanity has entered on the level of the Sixth Wave. I thus believe it is important to seek to clarify why this now seems to be happening on an unprecedented scale. Figure 1. 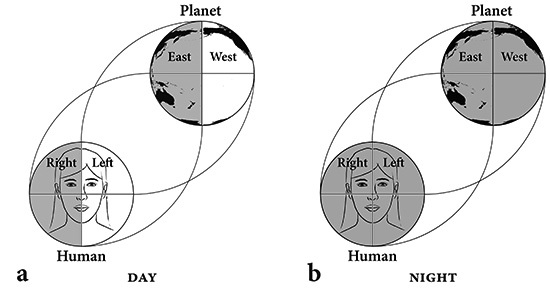 The Global Mind and individuals in resonance with it in the days (a) and nights (b) of the Sixth Wave. To explain the rise in disinformation, we should then first look upon the polarities of the global mind in the days and nights of the Sixth Wave, respectively (Figures 1a and 1b) and seek to understand how the shift from a day to a night affects the human beings who are the receivers of the global mind. In the big scale of things this wave very precisely describes the rise and fall of civilization as the days carry movement forward and the nights are essentially dark ages (Fig 2). The shift between the two phases of the Sixth Wave took place only five years ago, on October 28, 2011 to be exact, but it is essentially only from 2014 and onwards that the new global mind (Fig 1b) has come to be clearly expressed. That there was such a delay in this expression is not very surprising considering that this wave develops according to a relatively slow baktun rhythm (see Figure 2), where significant phase shifts occur as rarely as every 394 years. The recently begun night will thus last until 2406 CE and while going into a night is not the end of the world, it is something we will have to be aware of and learn to deal with. Figure 2. The days and nights of the Sixth Wave and corresponding major civilizations. The way humans are affected by the global mind is that as we establish resonance with a certain creation wave, our minds become dominated by the particular geometry and polarity of the global mind that it brings, such as is shown in Figure 1. Before we go into the direct effects of this it seems clear that this mechanism by itself may lead people to experience that something else is controlling their lives even if they do not have clarity as to what this is. This invisible influence is a significant background to the increased interest in conspiracy theory at the current time. Many now believe that certain groups of people (Illuminati) or spiritual entities (Reptilians or Annunaki) are manipulating their minds. In one form or another this interpretation of interventions by external forces, or gods, is thousands of years old, but to give power to such ideas is to avoid dealing with our situation on the level of consciousness. Regardless, humans perceive reality through the kind of filter that is provided by the global mind in resonance with a particular wave (see Figure 1). This filter then decisively leads humans to think that what they see through this filter is the way reality is, which leads them to create a worldview consistent with this filter together with a society whose relations reflect this. The dualist filter in Figure 1a, which creates a perception of separation, has for instance led humanity to create divisions between social classes and patriarchal dominance for more than 5000 years. When a filter is changed, as we are now beginning to experience the effects of, there is usually confusion and people do not know what to believe because they are influenced both by the filter that may have dominated them for their whole lives and a new filter that leads them to perceive the world in a different way. Chaos, and sometimes even collapses of civilizations, may then ensue as well as uncertainties as to what is the truth. Is it the filter of the day or the filter of the night that gives human beings the true perspective? Such a phase shift in the Sixth Wave in fact causes a significant mental shift that affects all aspects of human life. In the particular case of the phase shift we have just been through, it deserves to be noted that the Seventh day that preceded it generated the first global civilization in human history. Since, the pendulum swings in history as humanity goes through phase shifts, we should then not be surprised that in the new night there is a widespread rejection of the globalism, which came out of the previous day and the global civilization generated by the UK and US (Fig 3). Add to this that in the nights the structures that nation-states are based on are weakened and it becomes easy to understand that the world is now being swept by nationalist movements seeking to “take their country back.” Since this movement is an effect of the Sixth Wave, which brings the densest level of the mind, it is not surprising that this nationalism has become very emotionally charged – to the point that it may blind people to the truth and even what may be in their best interests. Fig 3. 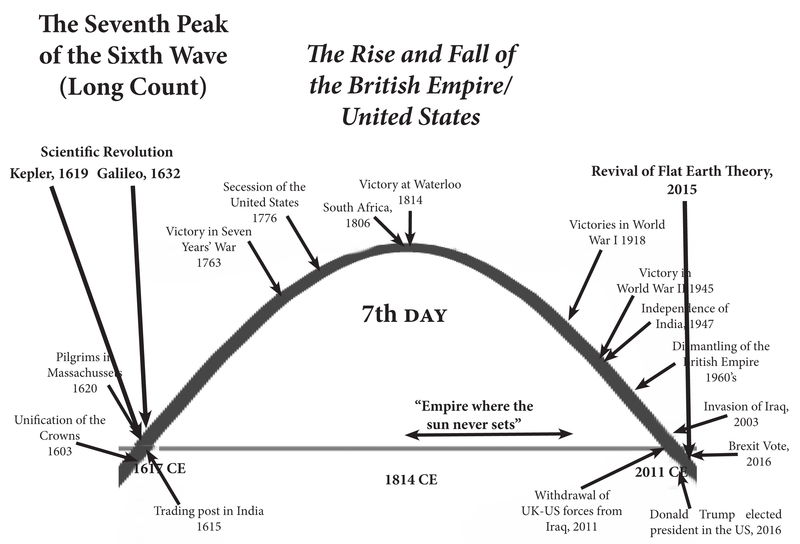 The rise and fall of the Western (UK/US) empires in the seventh day of the Sixth Wave. Note also the beginning of the scientific revolution. As I detailed in an earlier article (http://calleman.com/2016/08/17/trump-and-brexit/) these nationalist movements, which are often called populist, first manifested in the West, resulting in the Brexit vote and the election of Trump as president of the United States. The reason for this geographical expression is that the shift meant that the light was turned off in this hemisphere (Figure 1) and this is likely to relatively soon lead the world away from Western dominance. Hence, the steps now being taken by the Western powers to decrease international collaboration will most likely in 2017 lead to a more or less dramatic decline of the political, intellectual and economic power of the West. As a positive result of this we are also likely to see a decline in wars initiated by these powers, such as the Iraq War. Yet, the whole planet– not only the West– is being affected by this shift, which influences all individual minds and changes their attitudes towards the world in a very profound way. Another consequence of the duality going out is that many will feel a desire to liberate themselves from the control of the elites that dominated in the preceding day (1617-2011). Because of the shift they may also come to awaken to the oppression that they suffered from in this. Even if the changes that are happening in the world are not always easy to see, it should be obvious already from figures 1 and 2 that they are fundamentally brought about by the shift described by the Mayan calendar. The Maya that at one point represented the highest level of civilization in the Western hemisphere, created a calendar system that was not based on astronomy, but on their resonance with creation waves. Thus, no other calendrical system even comes close to its exactness of describing the rise and fall of civilizations. That there is such a time plan for the evolution of life on our planet leading up to the politics of today is probably new to most people, since in our educational system we have essentially been taught that life has no purpose or direction and that what happens in the world should be regarded as random events. Yet, for anyone who studies Figure 2 in detail or reads my books The Global Mind and the Rise of Civilization and The Nine Waves of Creation it should be clear that the evolution of our minds is created by our resonance with a series of creation waves, which direct the course of humanity. Whether we like it or not, in a sense our minds are being controlled by creation waves emanating from the center of the universe. Naturally, to the extent that they are unaware of this fact, people may now easily fall victim to false conspiracy theories. The reason the days are the periods when advanced civilizations are created in the history of mankind is that the dualist filter (fig 1a) that people download during these creates discernment. Hence, the polarity of the mind in those eras gives a basis for comparisons and creation of concepts that may be useful for our understanding of reality, which is critical for the rise of civilization. It is for this reason that duality is symbolized in a number of ancient symbols of wisdom, the most famous of which is probably the Chinese Yin/Yang-symbol (Figure 3c). It is the duality of our minds that creates discernment and hence also serves a basis for knowing what is truth. After all, in a dualist mind there is some light to compare the darkness with. Figure 4. Symbols of the duality of the global mind from Mexico, Sumer and China, respectively. Hence, the shift from a day to a night will not only lower the quality of art (as I discuss in The Global Mind and the Rise of Civilization), but also that of knowledge and science. The world simply does not look the same when looked upon through a dualist filter (Fig 1a) as through a flat dark filter (Fig 1b) and this is something that in different eras has had fundamental consequences for the creation of our predominating worldviews. This is the reason that in figure 2 it is the time periods that are days that have meant the most significant steps forward for instance in mathematics and science. In fact, the scientific revolution can be said to have started with the beginning of the seventh day of the Sixth Wave in 1617. The new geometric duality of the global mind then led to the predominance of a heliocentric world view through the works of Kepler (1619) and Galileo (1632, see Fig 3) as for the first time mathematics began to be used to explore the world of physics. This was a direct consequence of the enhanced discernment activated by the duality of the new global mind. The heliocentric worldview, based on the concept that the earth was a sphere, which together with other spherical planets revolved around the sun, then became the death blow to the flat earth theories that until 1617 still had been embraced in many quarters in Europe. What had happened was that when the flat mind we see in Fig 1b shifted over to the discerning mind of Fig 1a, at least some people such as Kepler and Galileo were able to see, and prove that the earth was a sphere revolving around the sun. Interestingly, in the past few years, as the global mind has again shifted to a flat mind (Figure 1b) some people have returned to the belief in a Flat Earth (Fig 3), not as a joke but as can be seen on Facebook pages as well as on YouTube they actually believe in this. This is another clear example of how some people are now mentally entering a dark age and project their new mind onto reality to create a false perception of this. The denial of science and climate change is for instance a typical characteristic of many anti-globalists, who based on their new mind will tend to deny everything that requires global collaboration: As Inside –So Outside. Regardless, it is in the shift to a night that we find the explanation to the current animosity towards everything global. People, who do not have discernment will simply thoughtlessly follow along with the shift and think that their new perception of reality is true, which is not necessarily the case. In many indirect ways both Brexit and the Trump presidency will also decrease the role of scientific knowledge in their respective countries. Brexit will for instance limit the international enrollment to what previously have been very high class universities in England thus threatening their quality. Trump, on his part is likely to cut the support to the EPA (despite forest fires in Tennessee in December). These anti-intellectual steps are only the first indications of what may come. It is very important today to realize the origin of the anti-globalism that currently sweeps the world in a shift to a dark age global mind on the level of the Sixth Wave. The reason that America has now elected a billionaire who brings together his Wall Street billionaire friends and Washington insiders to cut their own taxes and slash social programs for the rest of us, is partly the result (as verified by Trump) of ideas of anti-globalist conspiracy theorists, such as those from Alex Jones. In fact, many conspiracy theorists are not bothered by the imminent prospect of the United States turning into a dictatorship where health care, veterans administration and schooling becomes the sole privilege of the very rich. To them, if someone can present himself as an anti-globalist they will support him no matter where this may lead. This shows the power of the global mind when its effects are unconscious. Naturally, I am not saying that all conspiracy theories are false. There are real conspiracies and it may be good to know about them. Yet, when this becomes your only focus the new dark age mind in the Sixth Wave has taken over and there is a risk you may become paranoic rather than constructive. Courageous people, such as at Standing Rock instead take action for positive goals to better the lot of humanity and preserve the sacredness of the Earth. Also to be noted, not every conspiracy theorist tells the truth and anti-globalist theories proposed by nationalist demagogues may distract you from what is going on right in front of your eyes. The way out of such delusions is on the level of consciousness: It is not only to become aware of how the shift in the Sixth Wave mind has created new ways of thinking and acting in people, some of which may be beneficial, while others may be very detrimental. First and foremost, the way to freedom from the dark age is to develop resonance especially with the Ninth Wave, which represents the destiny of humanity. If this does not happen we are all likely to go down. I would say that the world is evolving toward a true respect of the Individual, rather than a continued fear-based respect for the “State” or “government”, which are but longstanding mental abstractions designed to enslave the Individual through widespread intimidation and social deceit. It is awakened Individual Consciousness which alone expresses Universal Divinity, which singularly brings us all into transcendent harmony and atonement (at-onement) with each others. When the Individual is fully respected, this false collective called the “State”, with its violent disrespect for Universal Individual Freedom, will naturally fall away. All “governments”, whether local or global in nature, are by definition a violation of the Individual. No one has the right to rule anyone but themselves! Well said David. Thank You. You suggest that these false conspiracy theories emanate only from non-MSM sources like Infowars, and so I think you are missing an important point. Many sources of information today push agendas that are not based on facts, and this particularly includes the MSM. We could even argue that the MSM began the process of presenting conspiracy theories as fact. As we were often told after 9/11, the world changed on September 11, 2001. It was then that the highest levels of the US government created the lie that unsophisticated Saudi Arabs managed to fly airliners into the WTC towers and the pentagon. This official conspiracy theory was recognized by many people as physically impossible, and so began the mistrust of what many perceive as government propaganda. The invasion of Iraq was justified as a response to 9/11, although it is now officially admitted that the justification was false. The reasons for the subsequent wars in Libya and Syria were also very weak and were merely carried out to advance Western geopolitical power. The wars definitely did not bring democracy to the Islamic world as was the declared intent (another obvious lie), but merely created more so-called terrorists. The mistrust of authority as purveyors of truth has created the conditions that allow conspiracy theories to flourish. Some theories are true and some are false, and we should see this as a natural result of entering the Night of the sixth wave. This is especially so as ability to discriminate is reduced by the lack of polarity. The polarity was necessary for the left brain processes that developed the maths and sciences, but it also had the effect of regimenting spiritual processes. Religious institutions took advantage by creating a power hierarchy that would appeal to polarized individuals. Today, without that polarization, individuals are freer to believe without requiring proof. This should facilitate the development of spiritualism at the level of the individual. My beliefs are mine and yours are yours. There is no requirement for a consensus reality, and no external religious institution can enforce it. This is a good thing, since the collective consciousness of the human race is the sum total of the vibrational states of all the individual members of the race. An external authority cannot force an individual to love. It must come from within. So in that sense, the lack of polarization may help the creativity of the ninth wave move the human collective consciousness to a higher state that would not have been possible in the sixth wave alone. The plethora of beliefs underlying the so-called conspiracy theories are a sign that the human collective mind is being shaken loose. The need for scientific proof and approval from authority figures are constraints that inhibit beliefs, and these constraints appear to have lost much of their power in this unpolarized Night of the sixth wave. Thanks to the creative periods of the ninth wave, we can hope that the sum total of individuals will still develop in peaceful directions. As you suggest, the alternative does not bode well. Good points. But I tend to think that it was the government and not the media that created the disinformation you are mentioning. The media essentially only reported what the government was saying. I think they also reported on the fact that the UN observers in Iraq found no evidence of weapons of mass destruction and then people could make up their own minds as to what was the truth. At the current time I would say that so called alternative media are providing much more disinformation than the mainstream and it will become increasingly important to protect the rights of the mainstream media to research and investigate. The media has been very willing to be the mouthpiece of the government, so I see them as one source of information. This was quite obvious when journalists allowed themselves to be embedded in the military. Clearly, they would be biased in their reporting because of that. Here in Canada, a CBC journalist planned a series of investigative reports on 9/11 related issues. The series was cancelled after the first episode was aired. It must have ruffled a few political feathers. So, no, I don’t think the MSM has been doing their job. And why would you expect them to. Surely the waves of conciousness don’t discriminate. Hello again William. I just wanted say that I think your thoughts about the disappearance of authority are excellent. Yes, the alternative is a technological tyranny, where “government” moves itself from outside of us to inside of us, through bio-implant microchipping, morphing humanity into a cyborg species under total control at every level. Thus, in order to prevent ourselves from becoming literal technological robots for the ruling class, we must transcend our own desire for control over others (by way of voting, or in any other way) and thus renounce our belief in “government” altogether. In short, we are at the crossroads of either being totally controlled, or rising totally above all control through an awakening of conscious awareness to our true Identity. The choice is between Forced Living, or Living by Grace. There will soon be no middle ground anymore. Such is the nature of evolution. Excellent explanation, Carl. I would like to forward to Facebook but there doesn’t seem to be a way here. Your last statement says to me, given all that is going on, that those of us who can help people connect to the ninth wave need to do so passionately in seminars and private sessions. This is not a time to be passive but active. Absolutely, somehow we also need to get organized. How does the arrival of “proto saturn:fit in with the Mayan calander?A. Earth and the human mind at the beginning of the Long Count. planet is ancient findings of eight-partitioning symbols in various. not want to discuss it. Science is science. I find the evidence as well Investigated and quite reoluutiionery /evolutionery. I think this is setting a new paridigm and will enable us to explain many things from a new position, including the long count. A.
viewpoints how can you be so sure of your position? It’s not so much a position but evidence of an event that happened not so long ago if not at the same time as the long count began. Surley that has to be interesting? A. To me what is interesting is the evolution of the biological species and the human mind. If there is no evidence of a phenomenon having a connection to this it is to me only a curiosity. Have you read the Global Mind and the Rise of Civilization? If you are interested in the evolution of consciousness I suggest that is the place you should start. Thank you very much. Your words of wisdom are moving to me. irregular than they currently are. I am still basically disappointed with the electrical universe people for not wanting to look at the alternative. The evidence is that the physical atributes ofthe planets that entered the solar system all have identicle paterns of alightnmens and behaviours. Thats the point they are explaining to there viewers. It seems quite obvious. a.
several billion years old. If you believe in the electric universe you would have to deny a lot of science. Exaactly. Most science is run by Tenure Power Blocks and money and is all unprovable theory and crazy concepts. A.
Wallace Thornhill said today that he wanted to read a copy of my book The Nine Waves of Creation and maybe it can lead to a meaningful discussion. Have you read it? Wondering if you have read Paul Stamets’s book , Mycellium Running? Mushrooms and all fungi have these root systems that are able to help save this planet. Interesting that some mushroom species bring about reforestation and some heal “incurable” diseases such as deadly viruses. Some transform poisons and even reduce radioactive substances. I want the media to broadcast these positive truths. Would offset the negative news if twere known. I find that visualization of my body merging with Earth, Sun, Galaxy and Cosmic Tree of Life helps transform fear. but I would not believe that the transform radioactive substances unless I see some direct evidence of it. Dear Carl, I was outside by garden re-reading Nine Waves of Creation when a honeybee lighted on your book. Remembered to say that mushrooms also can kill the mites that contribute to bee colony collapse. Thanks bees! I was out by garden reading Nine Waves of Creation when a honeybee lighted on your book. I remembered to say that some mushrooms and their mycellium have the ability to kill the mites that contribute to bee colony collapse. Thanks bees!